Level 10:1 – Power Up Acquired! 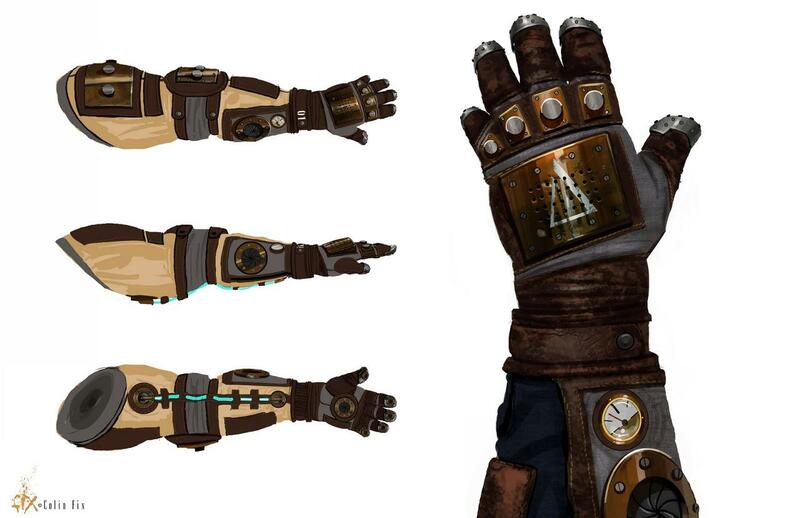 One of the coolest elements of Bioshock is the use of Plasmids! People in the Bioshock series use these by injecting the EVE directly into their blood stream and it endows them with powers and abilities. Subject Delta has a glove that allows him to pull EVE from a tank of his back and flow it directly into the veins at his wrist. We searched and searched the internet and hardware stores to find the ideal glove to serve as the base for Subject Delta’s glove and in the end we appropriately settled on some Halloween Darth Vader gloves. They were made of the perfect material, had the perfect look and were the perfect size and shape. 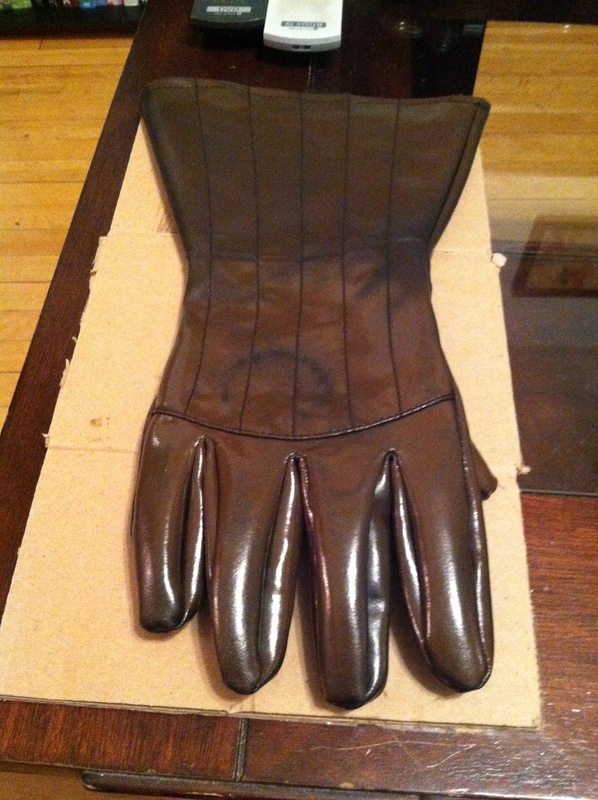 The gloves are one-size-fits-all for adults and come in black so we started by spraying the glove with a couple of light layers of Brown Leather paint. 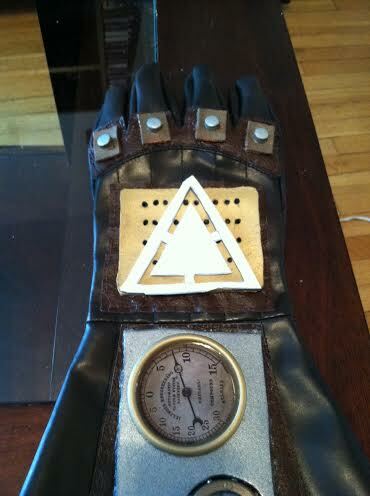 If you’ll notice from the reference photo there are some very distinct sections on the glove. On the palm side of the glove there are six ports; one on each finger, one on the thumb and one in the palm. These ports are used to conduct and control Plamids. 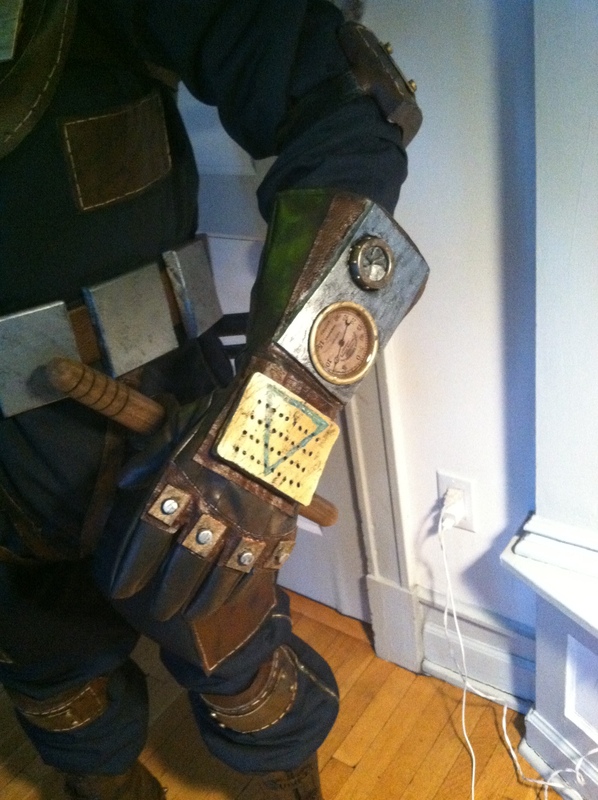 On the back side of the glove there’s a series of knuckle plates, a speaker box with the delta symbol, and forearm panel with a port and a gauge. In the game you see that the port is used as an injection point for the Plasmid syringes and the gauge I assume is used to determine dangerous usage levels. You’ll also notice that each of the three panels on the back of the glove appear to have a patch under them. So, we started by crafting these three patches out of some faux leather. We cut out two rectangular patches for the speaker box and Plasmid control panel and a customized piece for the knuckle plate. We then hand stitched the patches for added detail and sewed then to the gloves. Here’s a good shot of the customized patch for the knuckles that Sara made after we’d trimmed it and sewn it on. With all the patches in place we started on the knuckle panels. We cut out four contoured rectangular pieces from 2 mm foam and then used our hole punch tool from our grommet kit to punch out four rounded foam pieces from 5 mm foam. 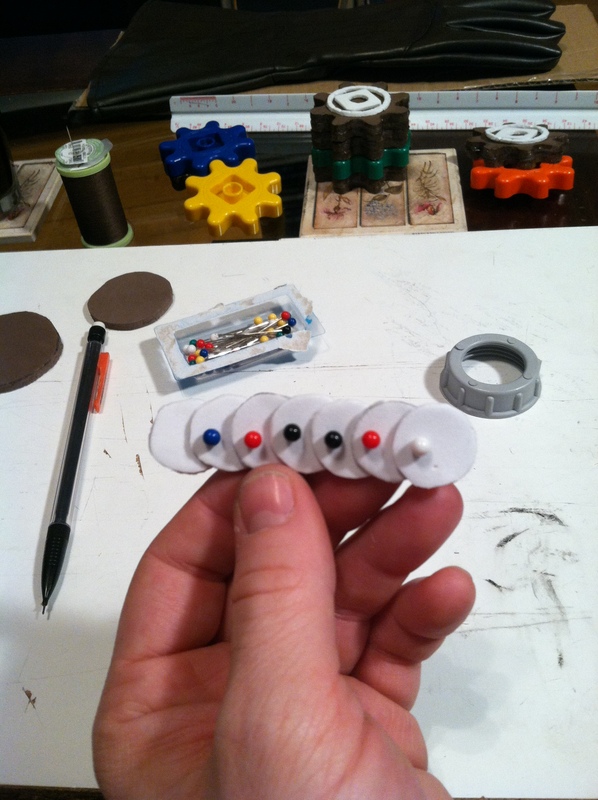 We hot glued the rounded pieces to the flat, rectangular pieces and laid them in place to see how they fit. Man that’s already starting to look gnarly!!! We trimmed the leather patch to more closely fit the contours of the glove and then in turn trimmed the foam pieces to more closely fit the contours of the customized leather patch. 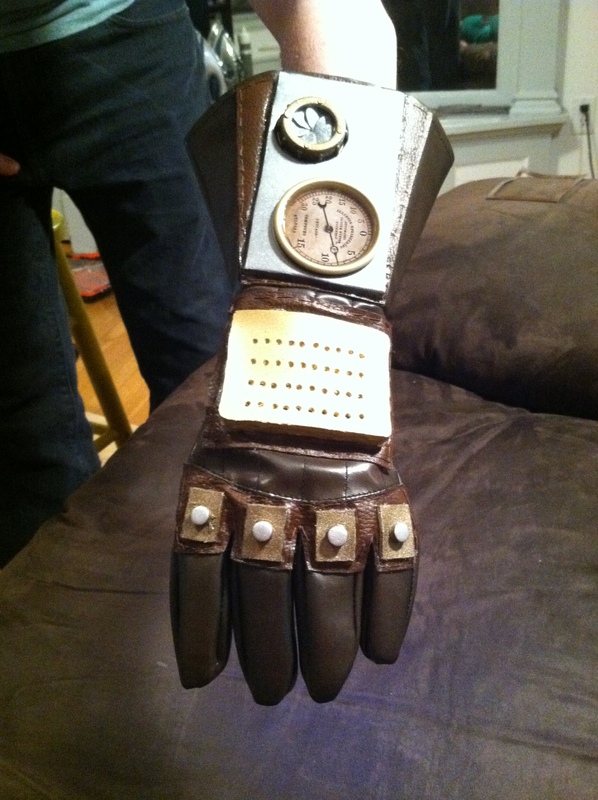 Once we had the shapes right we sewed the knuckle patch into place, sealed the knuckles pieces in Elmer’s glue and hand painted them brass and steel. Once they were dried we then used Shoe Goo to attach them. Next we moved on to the speaker box. For the speaker box, you’ll notice that it’s not just a flat metal panel. It’s raised at the front and slopes down the back like a small ramp. I cut out two large rectangular pieces of foam from the 2 mm foam; one to serve as the base for the panel and the other to serves as the top speaker ‘section.’ Along the front edge of the base piece, I attached a section of our weather sealer to serve as a ‘lift’ along the front edge. 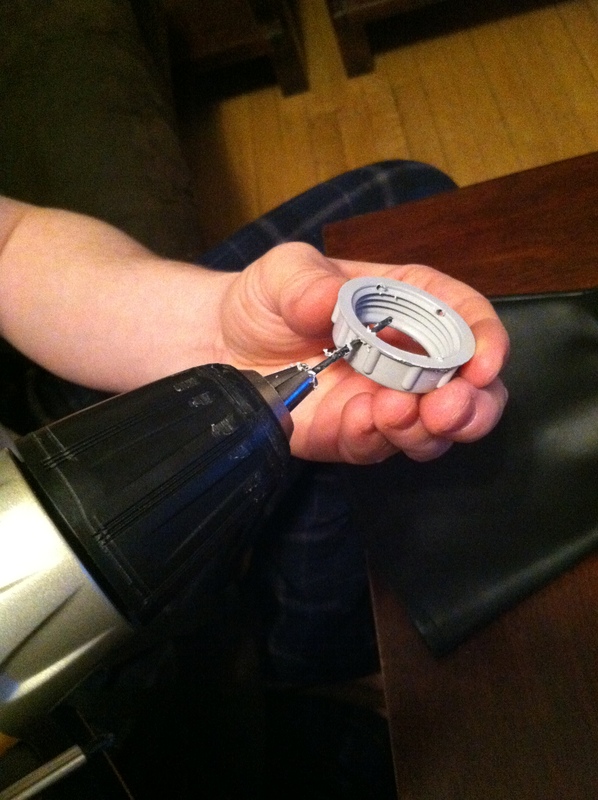 I then drilled a series of holes in the top piece to give it that old-timey speaker look. 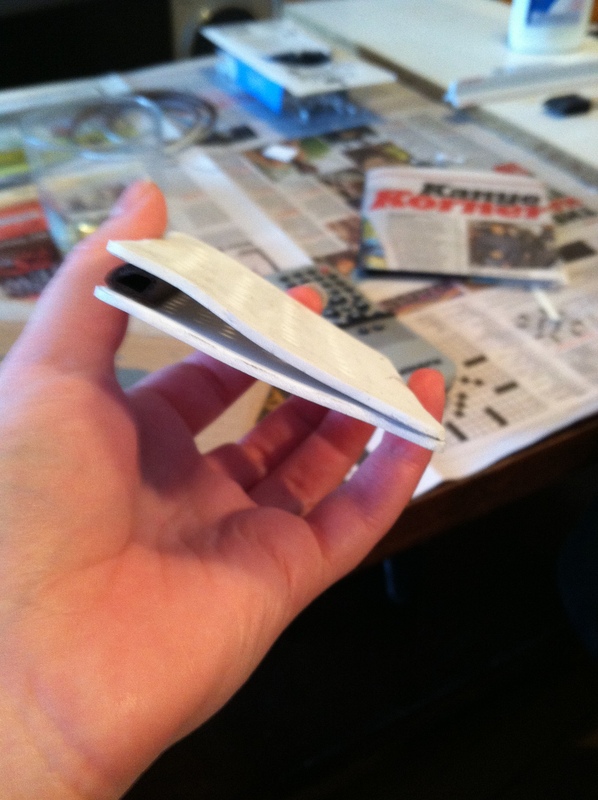 I hot glued the pieces together to form the lifted, ramp-looking shape. 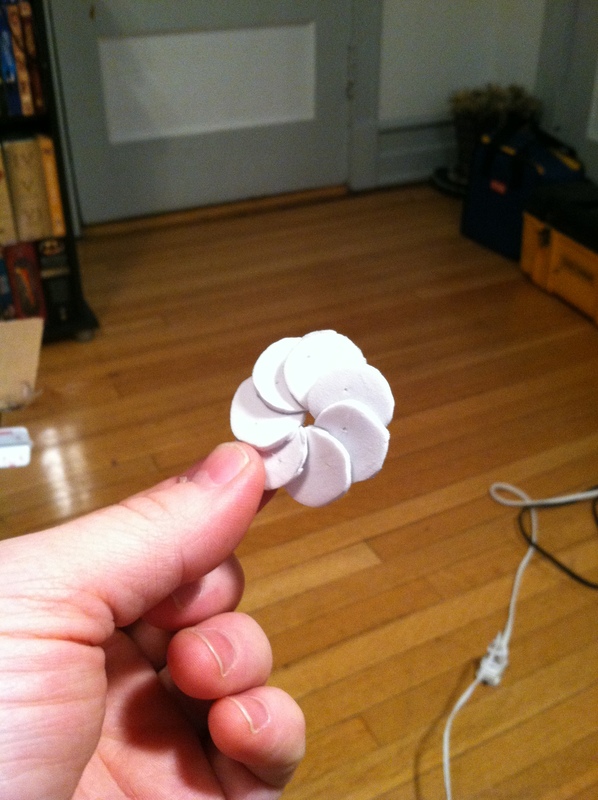 To finish the piece, I cut out 2 mm foam sections for the front and sides and hot glued them in place. I then sealed the panel with Elmer’s glue and painted it a polished brass. 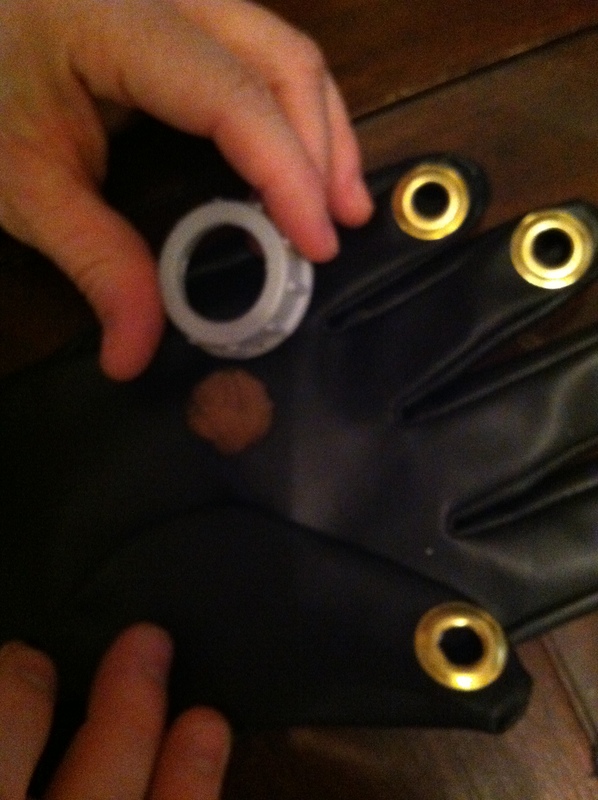 Once dried, we Shoe Goo’d it to the leather section on the back of the glove. At first, we tried to hot glue these foam pieces onto the leather but, as you can see in the close picture below, it wasn’t holding. Rather than try to re-glue it with more hot glue, we started looking for other options. That’s when we stumbled across the Shoe Goo. We’re recent converts to the contact adhesive cult and we have no plans to ever leave it. Next; the Plasmid control panel. The panel needed to be thick enough to house both the Plasmid port and one of our custom gauges so we cut the base out of 5 mm craft foam. The gauge was already constructed and ready to go from our work on Eleanor Lamb’s syringe, so we just cut out an opening in the foam to hold it in place and moved on to the Plasmid port. For the opening we used one of our plastic ports like we used on our helmets and then crafted the shutter out of 2 mm foam circles. With the port constructed we cut another hole in the base beside the gauge. We then sealed the 5 mm panel with Elmer’s glue and painted it steel. The port was hand painted polished brass and the shutter steel. 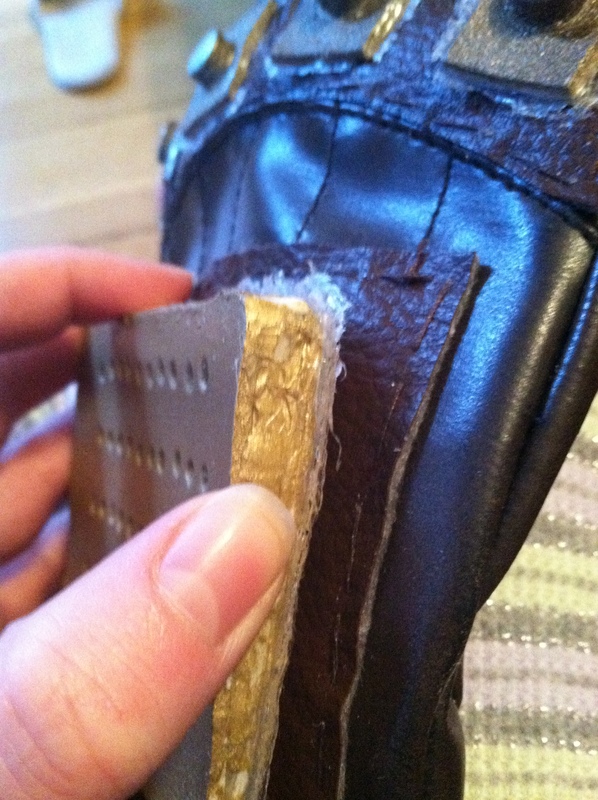 We hot glued the gauge and port into the panel and then attached the panel to its leather patch with Shoe Goop. 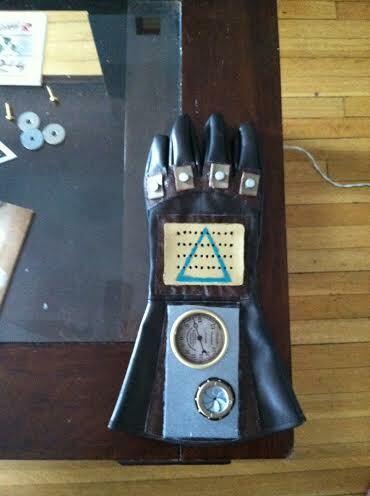 Here’s a couple of shots of the glove at this stage. Now for the first bit of real color… The Subject Delta symbol itself! Sara was so thrilled to finally be adding something other than a metal or earth tone to our cosplay. I started by cutting out a delta stencil from 2 mm foam. I laid the stencil in place and hand painted it with some teal acrylic paint. I then weathered the glove with some of our black acrylic paint and used an X-acto knife to lightly scrape away some of the teal to so our delta symbol didn’t look like it was painted on yesterday. With the back of the glove complete, lets take a look at the elements of the palm side of the glove. Now, this part actually came first, but I wanted to save it till last for effect. 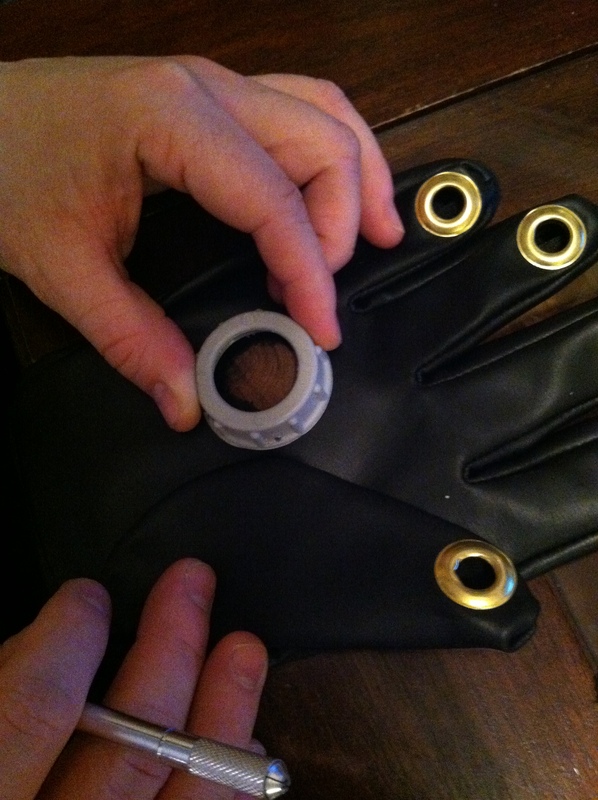 For the Plasmid ports on the fingers and thumb we used a standard 3/4″ grommet kit from Home Depot. 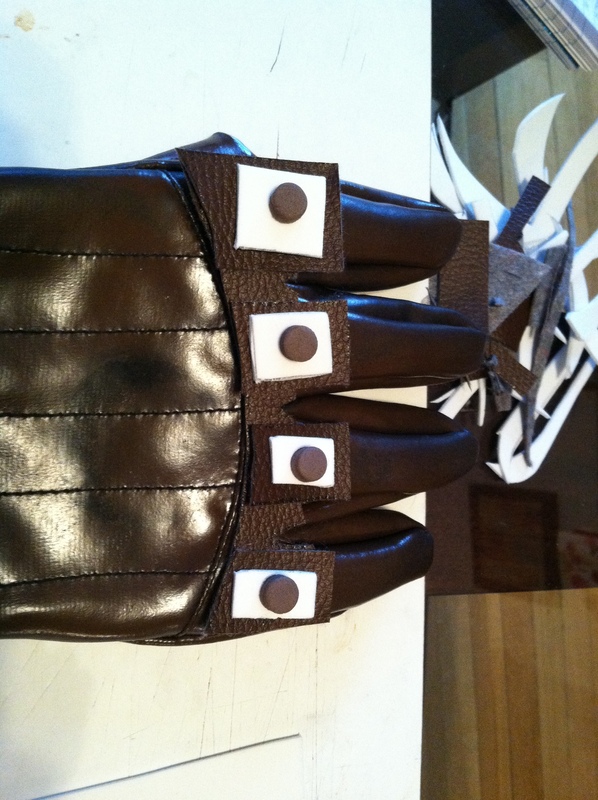 We followed the directions and used the metal hole punching tool to make the holes in the fingertips of the glove. We then fitted the grommets into the holes and snapped them into place. 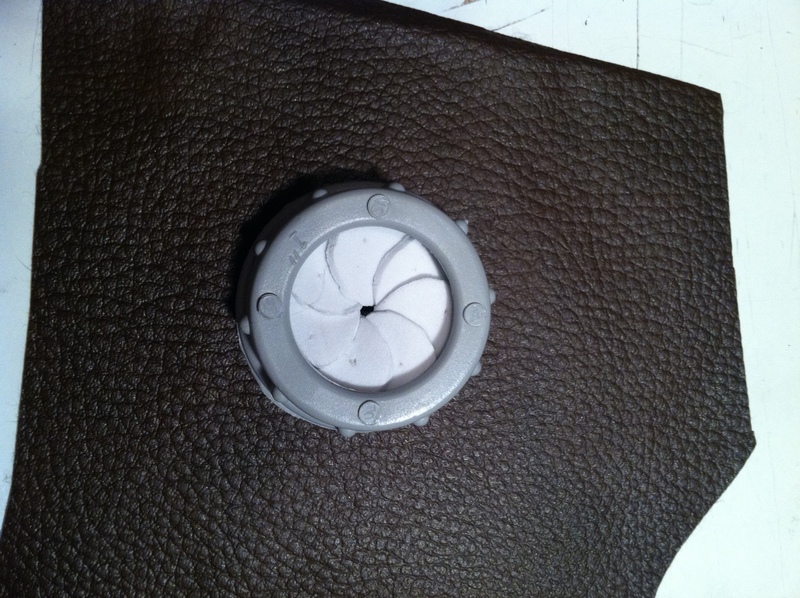 For the Plasmid port in the palm we used another one of our plastic ports. 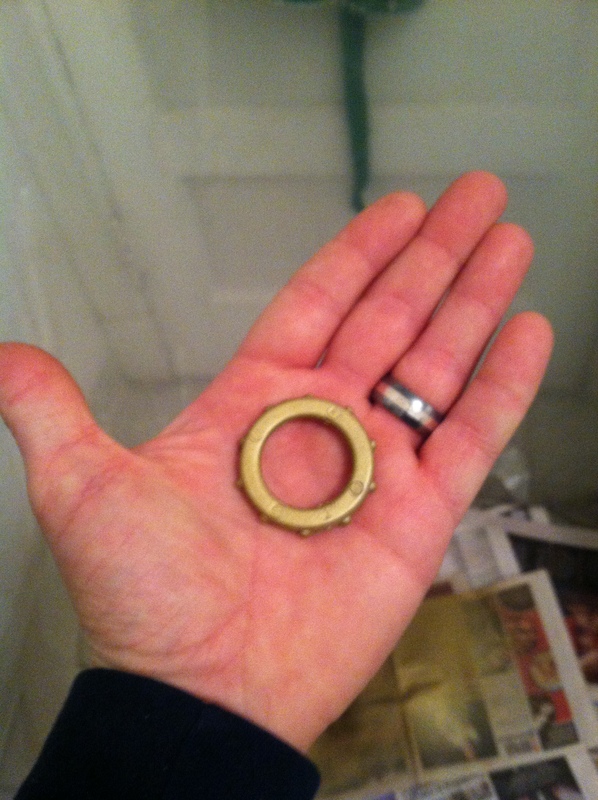 I used the port to determine the size of the hole that needed to be cut in the glove. Once the hole was cut I lined it up to see how it would fit. As you can see, the port is a little too thick and sits up too far from the surface of the glove. 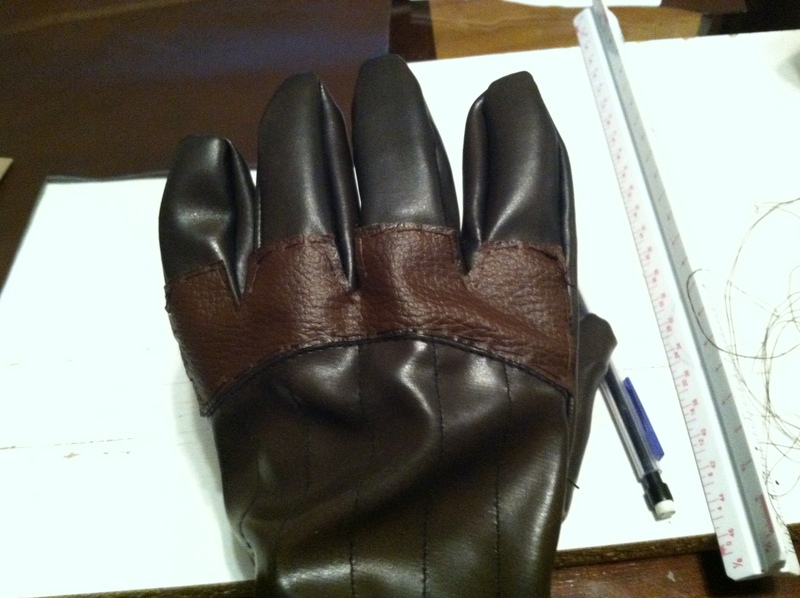 So, I used my hand saw to cut it in half, but before I did, I drilled some holes around the edges so that I would have a way to sew the port to the glove. With the holes drilled and the port cut in half I spray painted the port with some of the polished brass and sewed it to the glove. Last, but not least — it was time to add the lighting elements to simulate the Plasmid. As we discussed in the helmets post, we researched many processes and products that would allow us to incorporate lighting elements into our Cosplay. We even thought about trying to create our own custom circuit, but decided that was too advanced and time-consuming at this stage. 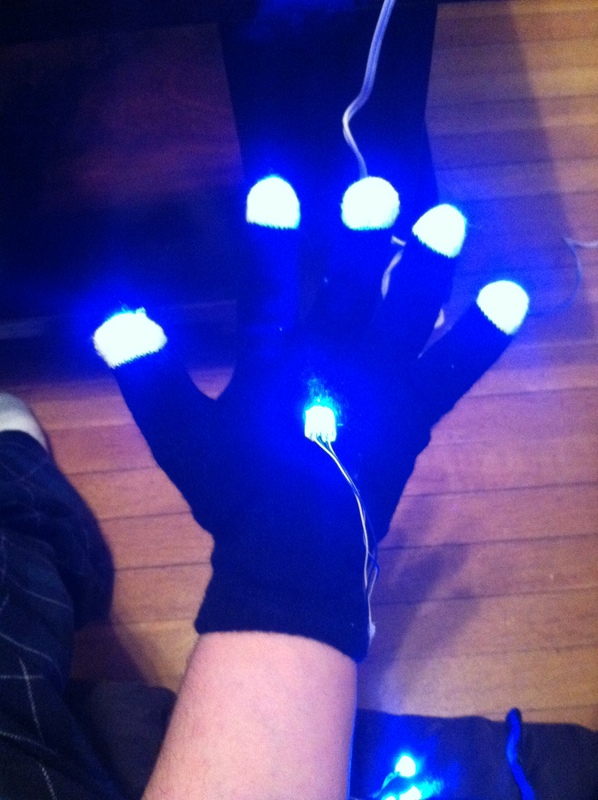 So, we ultimately decided on party raver gloves. Blue to simulate Electro Bolt; my favorite Plasmid! The gloves were perfect because they already came rigged with separately lit fingertips and thumb and had three pulse setting to choose from. 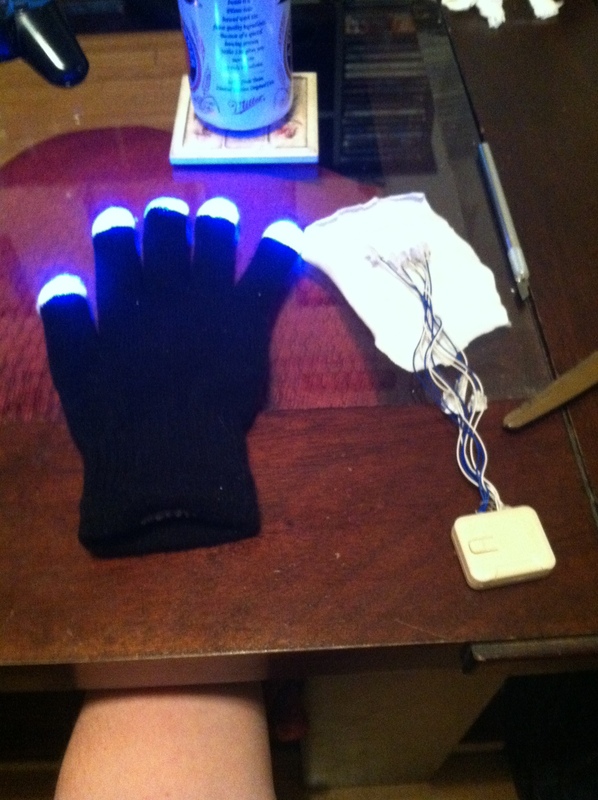 We purchased our glove from Blinkeez. 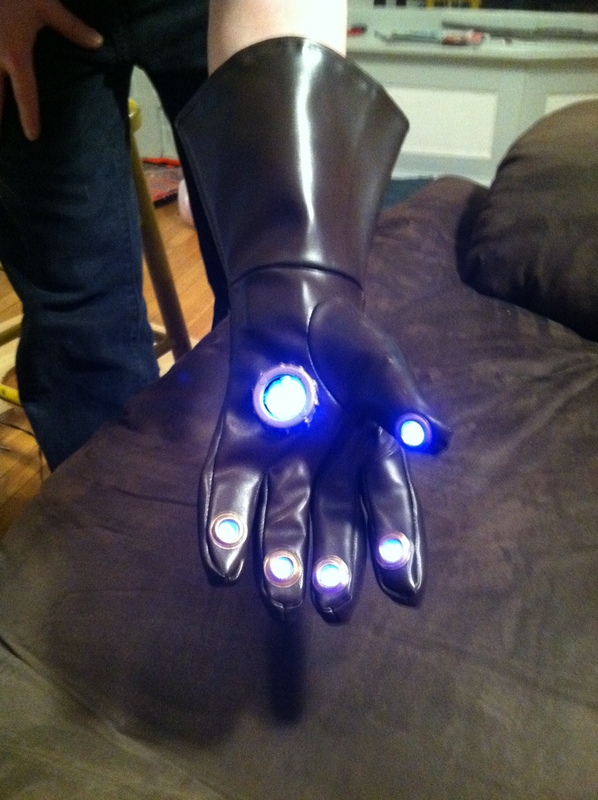 To rig up the light for the palm, we cannibalized the second glove from the set (since we only needed one) and hot glued the cluster of lights in place in the palm of the glove. The great thing about this is that we now had two separate power packs and circuits each of which could be set to a separate one of the three pulse settings to better simulate the Electro Bolt Plasmid and boyah! That looks so killer!!! Here’s a couple of demos for you to feast your eyes on! You can tell how long we actually were in the process by how unfinished Daniel’s costume was. Ha!